The start of a new week is so exciting because you don’t really know what lies ahead. Yes you will be going to work for the week but you don’t know what goodies God has in store for you along the way! This may be the very week that your purpose is revealed to you; or has it already been unveiled? Are you walking in your purpose; are you doing what you have been called to do? So many people miss out on the chance to do amazing things due to fear and not having the right team to assist them, money to start or survive without a 9-5 to back them up, or others because they don’t know what it is. What makes you happy when you get the opportunity to do it? Feeding the homeless? Reading to the elderly at the nursing home? Spending time with the kids at a women’s shelter? Reading to sick kids in the hospital? Buying gifts for needy families at Christmas time? Writing poetry? Offering friends advice when they are hurting or in trouble? It could be so many examples of what your purpose it. I once heard someone say that your purpose is what scares you the most, it’s way bigger than what you imagine and you can’t do it without the guidance and direction from above! It has to be instilled in you and you have to be passionate about it; because of the complexity and the capacity that it will reach. Your purpose can’t just be for you so it can’t be tied to money. Money is a necessity but it can’t be the determining factor. So much negativity is rooted in money and so many have lost their lives behind it. As we looks towards tomorrow which happens to be Memorial Day just remember these men and women had/have a passion for others; to go out and fight and protect people they don’t even know for a country they love. That’s purpose! Did you know you have power? We have a choice each morning we are blessed to open our eyes! We can control our attitudes and our responses to what comes our way. I used to have a problem with road rage! I would get so upset when someone cut me off! But when I stopped and thought about it; who was I hurting? Nobody but myself! I was raising my own blood pressure and possibly causing harm to my heart; due to the stress. Wasn’t worth it; I want to live a long and healthy life. Now when I’m on the road; I give those people who want to get a rise out of me their space! I stay far away from them and my drive is so stress-free. I control how I’m going to react and I love it and so does my blood pressure and my heart! Lol. This can apply in so many different situations; I’m sure you can think of a few. Try it out and see how it works for you! This question can be posed many ways; lots of options come to mind. 2. Why are you a single mom? 3. Why should you be his wife? 4. Why should you get this new job? 5. Why should you be promoted? 6. Why did you get fired? 7. Why did you become self-employed? 8. Why did he break your heart? 9. Why did he cheat on you? 10. Why did you move to a new city or town? There are so many different scenarios that can play out; but will they all generate the same answers or response? As a woman I’m sure we can relate to a few of the different questions posed and may very well have a detailed story for each of them. While we all may lead very different lives we all still have one thing in common; we are all women and we can all experience the same kinds of trials and tribulations. Being that we are all women shouldn’t we have each other’s back? Have a mutual respect for each other? Even though we may not personally know each other? I don’t know where it started or how it even got started or who sent out the memo that we were even suppose to be at odds; but we all can go so much higher and reach all time highs, if we just did our best to respect and admire one another! When you are walking down the street or hallway at work; would it be so awful to speak to the other woman walking towards you? Never mind she may look mean or like she doesn’t want to be bothered! You have no idea what she is facing, what she is going through or what she has been through! Your words can very well be what she needs to hear a simple “good morning” can brighten anyone’s day, especially if they are dealing with all kinds of craziness at home or on the job! You speaking to them with just a hint of positivity can trigger that goodness in their mind that may have been covered up and just needed to be released! As a woman I have experienced so much dislike from my fellow sisters and I know many of you can relate! Much of the dislike has no warrant at all on our part; so of us simple walk in the room and the looks of death start raining down! Why? I can’t fully answer that question but I will say that I never allow it to stop me from being who I am; kind, considerate, compassionate, emphatic, loving, caring and supporter to many; even those that dislike me! Ladies never allow anyone not even the next woman to steal your shine! We all can rise to the top! We don’t have to dislike the next woman for her climb up the ladder; support her, cheer her on, be her biggest supporter; so when it’s your turn you can expect the same. What else can we as women do to be better in our sisterhood? This post is inspired by the 2006 movie “The Pursuit of Happyness” starring Will Smith and his son Jayden. If you saw the movie then you would know why I spelled Happyness that way, Lol. I watched this movie for the 1st time just this week and I have to be honest I was in tears by the end of the movie. I could relate to the movie so much being a Single Mom and feeling like I’m the only one in the race trying to get to the finish line; and finding what will help me get to the place of happiness and stability. All throughout the movie Will Smith’s character faced so many setbacks but he kept on pushing and moving forward he was determined to get the job; wait better yet the career that would change his life like never before. When he was faced with eviction not once but twice; the first time he found another route that was much cheaper and smaller but it would do because he know better was ahead! But once again he came home to find all there stuff sitting outside the door; anyone else would have fallen to their knees and giving up but not him, he found another option, a shelter (some may not have went this route; but myself have been faced with that option) whatever you have faced or have to face you will make it through. Everyday at an internship that didn’t pay him not one dime! He was constantly tried and tested by management to get him to break but he always kept his composure. How many times have you been tried and tested on your job? I know I have been there many times and they were paying me; but never enough to go through what they were dishing out! At the end of the movie he finally got what he always wanted a career that changed his life and his son’s life for the better; and all he had to do was to keep his head up, no matter what he was faced with! How many times have you wanted to give up when the chips were stacked against you? You can defy all the odds placed in front of you. Once you grab hold of your dreams; never loss sight of them and always remind yourself why you are chasing them. When you have kids you will do everything in your power to give them the best that life can offer! Block out all naysayers they have absolutely no idea what your dreams are and how good it’s about to get! Always be your top supporter and don’t allow anyone to break you or your path to the finish line! Did you see this movie? If so, what are your takeaways? With Mother’s Day fast approaching I thought I would take out sometime to salute my fellow Single Mom’s and share some of my stories as I go through this journey. If you are a Single Mom then you know that the struggle is real and can very well be a challenge at times; but we press on and know that it won’t last forever! While this day is supposed to be a happy day of celebration I want to highlight somethings that we as Single Moms have to endure on a daily basis; so when you encounter a Single Mom just know that even though she may have a smile on her face, she is maybe hurting on the inside. We are just 1 person but may have to juggle other roles at times! Do anyone of you remember when they came out with Fathers Day Cards for Single Moms and people went ballistic! Lol the nerve right; are they in the household helping with the child(ren)? No, they aren’t but everyone has their opinion and 2 cents to throw in when it doesn’t concern them. They aren’t the one that has to miss work (and miss out on pay) when your kid is sick, or has a teacher conference at school. They also aren’t the one that has to do their best to keep a roof over their head, put clothes on their back, shoes on their feet, food in their mouth; all while only bringing in the income of 1 person! People are so quick to judge and kick you while you are down but don’t fully know or care what you have to endure on a daily basis! Where is this village that I keep hearing about? Many of us Single Moms don’t have this village that society says it takes to raise a kid! There are no men in the family to step up as father figures; there are no mentors at school that are willing to step in and spend time with your boys to help steer them in the right direction, heck there aren’t even any in the church! I asked a young pastor a few years back if he would like to mentor my boys and he kindly told me to call someone else! I’m not a fighter but for my children; I will. Not too long ago my teenage son went to take out the trash and came back home to tell me; that he had an altercation with the maintenance guy that cursed at him for no reason and got in his face! Me being his mother I had to go and approach the situation to see what transpired. As I walked down to where the incident happened my heart was racing and I began to talk to God; Lord you know I’m just a woman a single mom I’m not that big but I have to protect my son, his father isn’t around but I ask you please go before me and prepare this encounter because I don’t know what or who I’m about to face! As I got closer I saw the maintenance guy and asked was he the only one out there and had he cursed at my son; his facial expression quickly changed from smug to scared and he said yes but he was wrong and it would never happen again. He was upset due to the dumpster being filled and people were placing the trash on the ground and he had to pick it up, I don’t him that wasn’t my sons fault and we weren’t the only ones that lived there and why he decided to pick on a child! These are the types of situations we as Single Moms have to endure. The struggle is way to real. We really don’t want to be Single; But…. Having the desire to date but the pot being half full or empty. See when you have kids many guys don’t look at you as worthy! They look as you as a liability and quite frankly a waste of their time! Now don’t get me wrong lots of Single Moms get dates but many times that as far as it goes; a date and a nightcap, who wants that for the rest of their lives! We are still women and deserve the best and yes a husband not just some pit stop! 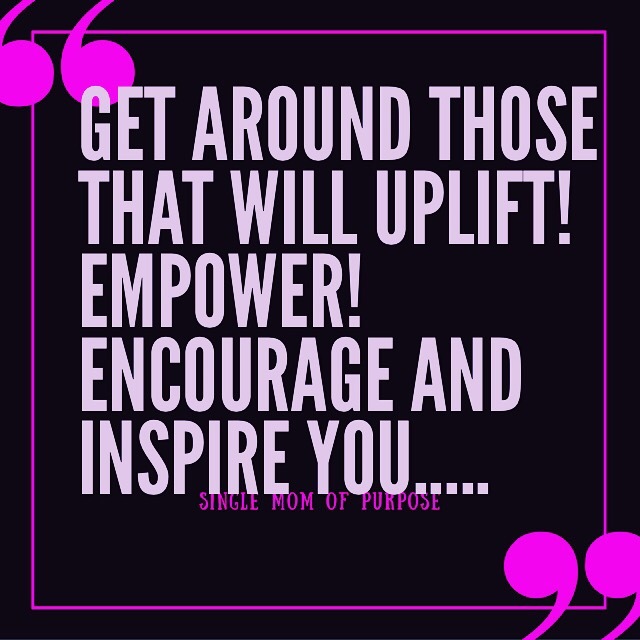 So the next time you encounter a Single Mom give her some words of encouragement, inspiration, hey even some motivation; we like all of those things and can use them to pick ourselves up when this thing called life gets us down. See being a Mom is really awesome and I’m sure none of us will trade it for anything in the world; but as a Single Mom it can be far more challenging and many times a very lonely journey. To all my Single Moms Keep Your Head Up…..